Tigernuts Fufu is one of the most healthy Nigerian fufu meals made with tigernuts. It is gluten-free, grain-free and low carb depending on who you talk to. Yes! It is low carb but NOT keto-friendly because it contains 19g of carbs per 100 grams of tigernut flour. As with all Nigerian fufu meals, Tigernuts Fufu is served with Nigerian soups for fufu meals. Click here for Nigerian Soups Recipes. If you want to keep the carbs as low as possible serve with Nigerian soups that do not contain high carb ingredients such as Ogbono Soup, Nigerian Okra Soup, Edikang Ikong Soup (Vegetable Soup), Miyan Kuka, Efo Riro, Banga Soup and any other Nigerian soup that does not contain a starchy thickener. Mix the following 2 ingredients in a bowl. Tigernuts flour is made from tigernuts also known as aki awusa, aya, ofio in Nigeria. Click here to see how to make Tigernuts Flour. 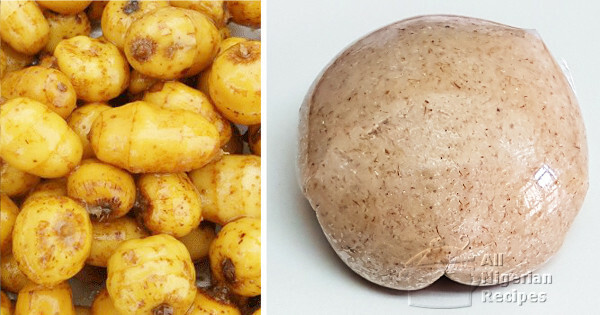 Psyllium husk and Xanthan gum are low carb binders that will make the tigernuts fufu moldable so we will be able to make balls of fufu with it while eating. Tigernuts flour is guten-free flour so fufu made with tigernuts flour alone cannot be molded into fufu balls. If you want to keep the carbs in your tigernuts fufu as low as possible, use the mixtures from the first 2 combinations. Please read up on these two ingredients to be sure they are good for you before you use them. See where to buy them from below. I used semolina in the video below but you can use any other flour that can be molded into balls as binder. You can use semovita, oat flour, plain four (all purpose flour), or garri. When using garri, you should first of all grind the garri into powder with a dry mill before mixing with the tigernuts flour. Tigernuts Fufu made with combination 3 ingredients contain more carbs. If you want to make larger quantities you can scale up the quantities of ingredients for instance for combination 1 you can mix 2 cups of tigernuts flour with 1 teaspoon psyllium husk, for combination 2 you can mix 2 cups of tigernuts flour with half a teaspoon of Xanthan Gum, for combination 3 you can mix 2 cups of tigernuts flour with 1 cup of semolina or any other flour you are using as binder. Once you have mixed them as stated above, the tigernuts fufu can be prepared like any other flour fufu recipe. Set some water in a pot to boil. For the above combinations, 1 cup of water will be enough. When making more, you will need more water. When the water boils, start adding the flour mixture bit by bit while stirring at the same time. After adding the flour, keep mixing till there are no lumps. When happy, add a few drops of water, cover and leave to steam all over. Mix again till smooth and wrap with a plastic film. They say that a plastic film causes cancer but to be honest, I am yet to find another utensil that can do a good job of keeping this tigernut fufu moldable especially if you use the mixtures from combination 1 or 2. So to use or not to use the plastic film? You decide. Serve Tigernuts Fufu with any Nigerian soup for fufu meals but if you want to keep the carbs low, serve with the low carb Nigerian soups mentioned above.